Last week I got really sick. I was so sick after four days of being glued to my bed, that I started to panic. I thought that with my arsenal of natural, cold-fighting remedies, I’d kick my sore throat, sleepless nights and high-grade fever to the curb, but I finally admitted that I needed help from…gulp…my doctor. She took some swabs, unsure of what had invaded my poor body and gave me a prescription for antibiotics just in case it was a bacterial infection. Just in case? I love how doctors just throw drugs around like they’re no big deal. What has the world come to? As bad as this situation seemed at the time, the antibiotics gave me the perfect excuse to discuss a very important topic and something that seems to be on everyone’s mind: probiotics. So, what are probiotics anyway? It has certainly become the new “it girl” ingredient in everything from yoghurt to granola bars and people seem to be catching on to the trend, buying probiotic enriched products by the truckloads. There’s just one little problem: no one really knows what probiotics are! What the heck are probiotics? BONUS!!! Probiotics are helpful in the treatment of constipation, diarrhea, Irritable Bowel Syndrome, Chron’s Disease, ulcerative colitis, yeast infections, urinary tract infections, allergies, skin problems and Candida. Let’s jump back to the topic of antibiotics and break down the word itself. “Anti” means against, and “biotic” means life. Antibiotics are against life, and they work by wiping out all bacteria in the body (the good kind and the bad kind) in order to get a sick person healthy again. In times of need, they are life saving, but they certainly shouldn’t be taken “just in case”. Obliterating all the bacteria in your body is an incredibly drastic thing to do if you don’t have to. With a little logic, we can deduce that the word “probiotic” means “for life”. This is precisely why during and after a course of antibiotics it is essential to bring those friendly little guys back to your gut. Have you ever experienced diarrhea, flatulence, fatigue, skin problems or yeast infections after a taking around of penicillin and the like? It’s because all your little warriors are gone! Yikes! – drink chlorinated (tap) water? – take over-the-counter medication (aspirin, antacids, antihistamines etc.)? – eat processed foods (containing preservatives, additives)? – take birth control pills? – use steroidal & hormonal drugs? – drink carbonated and/or caffeinated drinks? – watch a lot of television or use a mobile phone (exposure to radiation)? Based on that list, chances are good that your bowels aren’t in the shape they could be, right? The good news is you can counteract the effects of these factors by taking a daily probiotic supplement. This is especially critical after consuming antibiotics, and a very thorough re-inoculation regime should do wonders for your digestive system, after it’s taken a beating! We should also be aware that our diets play a serious role in the ecology of our colons. Certain fermented foods like miso, tempeh, sauerkraut, and natural yogurt, encourage the growth of friendly bacteria populations. And, if you’ve ever heard the term “prebiotic”, another trendy term that is being thrown around by food manufactures these days, it refers to certain types of non-digestible foods that make their way through our digestive system and help good bacteria grow and flourish. Prebiotics come from eating certain types of carbohydrates fibers that feed beneficial bacteria and keep them healthy. Sources of prebiotics include raw vegetables and fruits, legumes and whole grains. Sometimes probiotic supplements will include a prebiotc fiber, often referred to as FOS (fructo-oligosaccharides). Like I mentioned earlier, many food manufacturers are jumping on the benevolent bacteria bandwagon and in my opinion, ripping people off. A large proportion of grocery store products simply do not deliver the benefits of probiotics because they lack the potency and nutrition of a true supplement. You can tell just by watching some advertisements for probiotic-enriched whatever…do they really say anything at all? Hardly. Pick up your probiotics at a health food store and speak to a qualified, non-biased employee about what they offer. A single dose of probiotic supplement should have a MINIMUM of 10 million live bacteria, experts say. It is also clear that these bacteria should be from one or more of the Lactobacillus family – which are just about the only ‘friendly-bacteria’ tough enough to make it into the large intestine where they need to be! After a course of antibiotics, I take between 30 and 50 BILLION everyday for a week just to re-inoculate, followed by my regular 15 billion daily just to keep my bowels in top form. You can experiment with different amounts to see what works best for you, but if you are just beginning to take probiotics, I would start with a rather high dose to get the ball rolling. Please keep in mind that these powerful, health-enhancing team players don’t always come cheap. Your health is an investment! You may be paying upwards of (gasp!) one dollar a day for good quality probiotics, but it is worth every penny. Don’t sell yourself short. 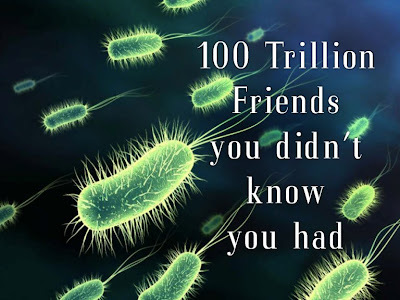 Those 100 trillion friends you didn’t know you had need all the help they can get. Especially when your doctor gives you antibiotics just in case, or in my case for no reason. The tests came back negative. info source: Jensen, Bernard Dr Jensen’s Guide To Better Bowel Care New York, NY: Penguin, 1999. Hi Sarah! Thanks for your helpfull blog post about pro biotics! I was wondering, you included a link to gonando.com as a source, is this the specific kind and brand you use? too myy blog that automatically tweet mmy newest twitter updates. youu would have some experience with something like this. I truly enjoy reading your blog aand I look forwrd to your new updates. Hello! What brand of probiotics would you recommend? I want to make a good investment in my health, but I don’t know how to decided what brand to get. Good question. In my studies we learned that it was best taken with food, but since I’ve read conflicting opinions that is best absorbed on an empty stomach. I wish I could tell you for sure, but I can’t! Is it best to take probiotics before or after a meal? On an empty stomach? HA! Well, I certainly know THAT feeling. They’ll all catch up eventually 😉 Keep on spreading the word! what brand probiotic were you getting when you were here?